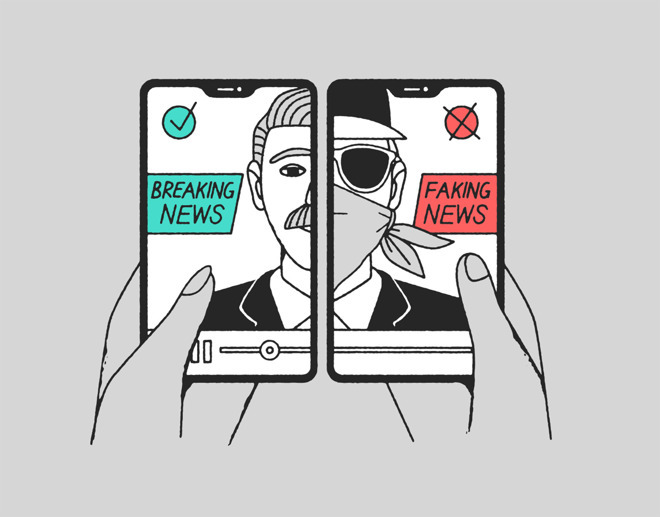 Ahead of an expected news subscription service launch, Apple on Tuesday debuted a new initiative to support leading nonprofit organizations in the U.S. and Europe that offer nonpartisan, independent media literacy programs. "News literacy is vital to sustaining a free press and thriving democracy, and we are proud to be collaborating with organizations on the front lines of this effort," Apple CEO Tim Cook said, announcing the cooperative effort. "We've been impressed by the important work being done by the News Literacy Project, Common Sense and Osservatorio, empowering young people to be active and engaged citizens." The News Literacy Project (NLP) is a nonpartisan national education nonprofit, and empowers educators to teach middle school and high school students the skills they need to become consumers of news and other information and be able to participate in the U.S. democracy. More than 17,800 educators in all 50 states, the District of Columbia, three U.S. territories and 104 other countries have registered to use it, and more than 124,000 students have benefited from its lessons since its founding in May 2016. "We are grateful for Apple's commitment to fighting misinformation and sustaining quality journalism," said Alan C. Miller, founder and CEO of NLP. "NLP is committed to equipping the next generation with the critical thinking skills to discern what news and other information to trust and the tools to become informed and engaged participants in our country's democracy." Another partner, Common Sense, is the leading nonprofit organization dedicated to helping kids and families thrive in the digital age. To help students process the modern news landscape, Common Sense aims to help students not just seek out legitimate news, but also think critically about the broader world of media and ideas. "The lack of young people's news literacy skills is a growing problem for our country. Revelations about the manipulation of news and the resulting impact on society have shed light on both the importance and scale of the issue," said James P. Steyer, founder and CEO of Common Sense. "We need to help our students not just seek out legitimate news, but also think critically about the broader world of media and ideas." Osservatorio Permanente Giovani-Editori is Italy's leading independent organization in citizenship education focused on media literacy projects. Osservatorio operates in education by training high school teachers, who then bring Osservatorio's media literacy projects into their classrooms with the goal of increasing critical thinking skills. "Our mission is to help young people develop critical thinking skills by comparing different sources of quality information," said Andrea Ceccherini, founder and CEO of Osservatorio Permanente Giovani-Editori. "At a time when fake news is spreading, we cannot give in to the idea that third-party fact-checking services are the only way to assess the reliability of news sources. We can exercise our own minds, and be masters of our own destiny. Our ambition is to help form more citizens, increasingly opening our society to a culture of civilized debate and confrontation, which is the basis of every healthy democracy." Hints of Apple's subscription news service first appeared in January. Early details about the service in iOS 12 betas included numerous references to a "bundle subscription," which could back reports that Apple is planning to sell a broader package combining Apple News Magazines with Apple Music and upcoming video content. Other stories, though, have hinted that Apple might make some video free to people who own its devices, at least initially. Since that first hint in iOS, hooks for the service have appeared in macOS betas as well. Apple is expected to announce a number of new services at its March 25 "It's show time" event, with Apple News being one of the main highlights anticipated to launch. The March 25 event will reportedly be a star-studded affair, with appearances by people such as J.J. Abrams, Jennifer Garner, and Steve Carrell to commemorate the unveiling of Apple's original video content project, which has seen the investment of at least $1 billion so far into TV shows and movie productions. Critical thinking skills among the general populace are a critical (no pun intended) element of the antidotes to so-called "fake news", propaganda and mis-information. Of course something like that would keep politicians (of all flavors) and the media on their toes because despite the somewhat recent popularizing of the "fake news" term, many mainstream politicians (again of all flavors) and media sources (yes, even mainstream media) have trafficked, for decades, in stuff in would fall apart under critical thinking. All I care about is honest journalism. Everyone has their biases. It’s human nature, but it takes a true journalist to be honest. Unfortunately I have found that there is zero honesty in the mainstream media and only talking points and agendas handed down from the Bloomberg’s and Soros’ of the world trying to control the message which is why I’ve stopped watching altogether and I’m better for it. The US is not a democracy. It’s more akin to a representative democratic republic. People thinking the Federal government operates as a democracy is part of why people are so misinformed and emotionally overwrought these days. Remember when people were screaming and crying that their preferred candidate won the “popular vote”? The popular vote is irrelevant! "representative democratic constitutional federal republic"
A political scientist would say that the US is a type of democracy: a representative democracy, rather than a direct democracy. There are no countries in the world (anymore) that are direct democracies (even referenda are typically framed through non-democratic processes). Madison did distinguish between "republican" and "pure" democracy or "mob rule," but not between "republic" and "democracy." ps. I agree with you about the Electoral College. Them's the rules. I have said this before, until the media and the people who are writing on a subject are as knowledgeable on a topic as the person they are talking to or subject they are reporting about, then you will not have good reporting that people could use critical analysis on. I listen to interviews all the time and I have a long list of questions I have which the reporters never ask, so the person talking just shares what they want you to know whether it is relevant or not. Then you have the media throwing statistic around and have no idea about the number behind the stats, I will give one good example that media did and keep repeating until someone point out the actual numbers. You all heard about the claim that people on the no-fly list was buying guns and they said that 93% of the people on the no-fly list which bought a gun passed a background check and everyone was outraged, Well there is ~3 million people on the no-fly list, no one know why they are all on the list and whether they actually did anything wrong. the ATF/FBI said 211 of them apply to buy a hand gun and had a background check and 196 were grants the other 15 were not for various reason. So the system worked and of the ~3M on the list only 196 actually decided to buy a gun not 100's of thousand the media tried to make it sound like. The question, was the media just lazy (I would like to believe this), just too stupid to ask the right questions (most likely the real answer) or they knew the correct information but wanted to tell a story (this is what the fake media people wants everyone to believe is happening). The problem is you can no longer take it on faith the person one the other end of the story is trustworthy and creditable and you have no chance to validate this ahead of time. When the see the media messing up on simple facts I know I can not trust them on the important facts. This is the kind of critical analysis everyone should be doing. I hope Apple is successful, in order to do what they are saying, it requires more than critical thinking, you need time and have a basis of known facts to compare against what is being said. People are too lazy today to check anything. No one is interested in learning or being told they are wrong, if you tell them they are wrong most will just ignore you. Here is a good article where the write did break down the facts from statement being made by politicians, most people will not read this they will just take the word from the months of these people as being true. The moment you step out of the US, the truth looks very different on many issues from when inside. The US "democracy" that is imposed on the world often at gun-point, drone-point or all kinds of sanctions do look very different to those being "democratized". So Apple need to tread very carefully about what is fake or true to not alienate customers outside the US. One of the biggest challenges we're faced with today, especially among the younger population who have growth up in a connected world since they left the womb, is that anyone with a social media feed can easily become a "media content creator" and a "broadcaster" regardless of their knowledge, expertise, credibility, or adherence to anything resembling a grounding in "journalism." We all like to pile-on the big media sources and talk about enforcing quality standards for journalism, but many of those alternative media sources using individual Twitter, Facebook, YouTube, etc., to broadcast their self-serving media don't give a rip about anything of the sort, and many of them have legions of subscribers slurping up all the nonsense that these rogue broadcasters are spewing. Putting a fancy dress and lipstick on the few remaining old school sources of broadcast journalism and asking them to play nice is not going to shut down the purveyors of deception who don't play by anyone's rules. Anything that Apple, parents, teachers, mentors, empathic leaders, and influencers of open minds can do to better equip people to deal with the onslaught of deceptive media is worth a try. But it's an upstream paddle in a raging river and the waters are only getting rougher with every new tweet stream feeding into the river. Critical thinking is a useful paddle, but it'll be overwhelmed if nothing is regulating the media river's flow. If you need to learn critical thinking as an adult, consider your education a failure. I do not want or need a for-profit company telling me what to think, or a not for profit one, either. Everyone has an agenda- everyone- and if there is money in manipulating it, it will be corrupted. The problem is we have a massive number of adults that really don’t have the mental chop to think critically. Many of these people get exploited by others with far more wavy about getting what they want. The last presidential election was a perfect example as Clinton got far more votes than her platform rationally should have generated. The vast majority of voting was against Clinton. Like wise the last election resulted in a bunch of idiots being elected after which people are shocked at what comes out of their mouths. No critical thinking at all, just emotionally manipulated people that can’t think for themselves. We Are truely surrounded by idiots. As for your your second point I agree 100%, this is just another avenue for Apple to manipulate the world to reflect their views. The so called "Free Press" has always been beset with propaganda and fake elements. I agree 100% with Davgreg, all bets are off once money enters the equation. Let's not act like the News Media is the reincarnation of Perseus bringing fire the the plebes. They are Oligarchs with their own agenda that filters down and through all tentacles.